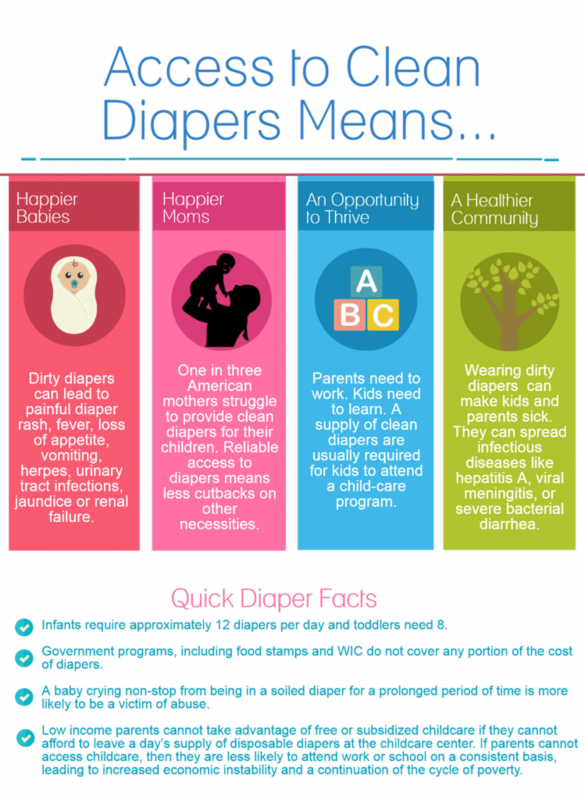 One in three American mothers struggle to provide diapers for their babies. These mothers have to cut back on basics such as food, utilities including heat and electricity, or even child care in order to provide enough diapers for their baby. Frequent diaper drives and fundraisers have helped to keep the supply of diapers sufficient to meet the output of several hundred diapers each week. Local churches, community groups, friends and neighbors have very generously donated both product and money to keep the shelves full. Our top priority is to see diapers distributed along with needed food products. Once the community realizes how much our moms struggle, our diaper bank will be full of diapers all year round, and we will never have to turn a mother away empty-handed.